The Global Festival of Action for Sustainable Development is a ground-breaking event powered by the UN SDG Action Campaign with the support of the German Federal Ministry for Economic Cooperation and Development (BMZ), the German Federal Foreign Office and partners. The Festival’s overall aim is to gather and inspire SDGs campaigners and multi-stakeholder partners to scale up and broaden the global movement to take action for the SDGs. 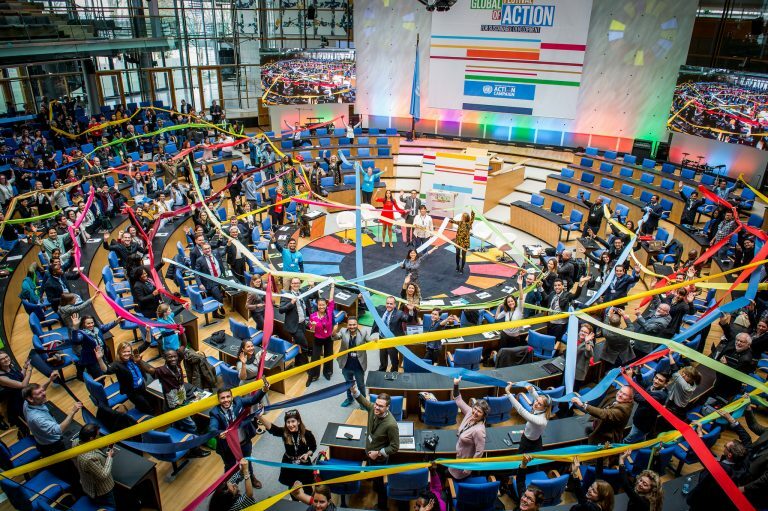 Taking place in Bonn every year, the Festival provides a dynamic and interactive space to showcase the latest innovations, tools and approaches to SDG advocacy and SDG action. It brings together leaders from governments, local authorities, international organizations, civil society, activists, young advocates, the creative industry and the private sector– to scale up the impact of their work and strategize joint actions, whilst motivating new organizations and individuals to join the movement and take action for the SDGs. The overall aim of the Global Festival of Action is to mobilize, inspire and connect stakeholders to further SDG action. Throughout the next two years campaigning, evidence-based advocacy, and coalition building will be critical to keep the momentum on world leaders’ commitment to the SDGs and on the 2030 Agenda for Sustainable Development. Strengthen current SDG partnerships, explore new alliances and leverage the presence of SDG actors to discuss strategies and joined initiatives around key milestones events in 2019 and 2020.